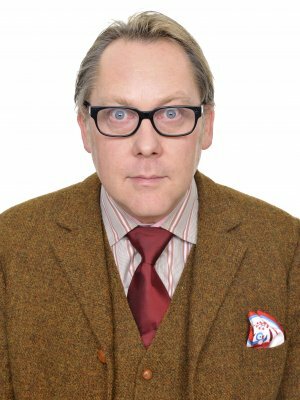 When Vic Reeves was first presented to the TV public he called himself Britain’s Best Light Entertainer. He could sing, dance, be funny, act and even draw! That was at the start of 1990 with the launch of Vic Reeves: Big Night Out and since then he has grown into one of the most treasured entertainers of the last 25 years. Perhaps best known for his double act alongside comedy writer and performer Bob Mortimer, the two created cult panel show Shooting Stars in the mid-90s. Running for an impressive eight series, the show allowed for riotous onscreen antics featuring different celebrity guests each week. The show introduced comedy scorekeepers George Doors (Matt Lucas), Angelos Epithemiou (Daniel Renton Skinner) and not to mention the Dove from Above. Vic’s recent TV credits include writing and starring alongside Mortimer in the BBC2 sitcom House of Fools, which aired for two series. He recently played Geoffrey in the BBC rendition Inspector George Gently and was a contestant on The Great British Bake Off for Comic Relief, narrowly out to fellow comedy legend Victoria Wood. Vic and Bob are award winners in their own right, having scooped Writers Guild of Great Britain Award in 2012 and the Loaded LAFTAS Award in 2011 for their contribution to British comedy over the last 30 years. In November 2015 the duo mark their outstanding impact on our comedy history with a three month UK Tour, ending in February 2016. Vic Reeve’s profile, experience and wit make him the perfect host for a range of corporate and private events. Previous corporate work includes hosting the BAFTA Video Game Awards to great acclaim, hosting the Specsavers Celebrity Spectacle Wearer of the Year Awards and featuring on the panel of the live Sky Movies Debate: Which is The Best Batman Movie? Other corporate clients include Renault, Fanta, Lynx, First Direct, Essilor Eyewear, InTu Shopping Centres partnered with the RSPB, Sky B2B and Cuprinol Sheds. We are really pleased with how the event went and …Vic [was] really well received by the audience and fellow panelists alike…both Sky Movies and Shortlist agreed that [he was] a great fit for this event. [His] presentation [was] very funny and anecdotal, which the audience responded well to. SKY MOVIES DEBATE: WHICH IS THE BEST BATMAN MOVIE? Just to say that Vic Reeves was a great Success. He was right on message, played ball with all sorts of request for daft poses, cam up with some great positive anecdotes about his time as an apprentice? We are really pleased with how the event went…Vic [was] really well received by the audience and fellow panellists alike – all 5 members of the panel stayed for a full hour after the debate to have drinks together in the garden!…The audience were really receptive to Vic…And both Sky Movies and Shortlist agreed that [he was] a great fit for this event. His presentation was very funny and anecdotal, which the audience responded well to.